Oechsner Farms is really about the people who work, live and sweat here. They give us joy most days and it's our privilege to get to spend our long days farming with them. 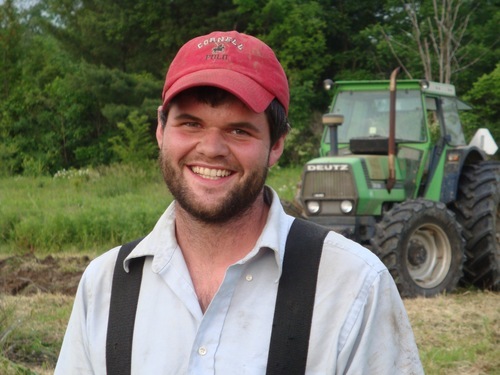 Founder and owner of Oechsner Farms, Thor grew up in the suburbs of New York City in Croton-On-Hudson. Through summer trips to his uncle’s dairy farm in Pennsylvania, he became completely fascinated with agriculture. Eventually, he plowed his parents’ lawn and planted corn. Since he wasn’t born into farming, Thor built his farm bit by bit, scouting for abandoned fields to rent and restore to cropping. In 1991, Thor purchased his 15-acre home farm. In 1998, he started Oechsner Farms on 44 acres of rented ground. As Thor gained experience and equipment, he steadily added acreage until he could support himself exclusively by farming. In the meantime, he ran a Volkswagen shop and taught diesel mechanics at BOCES. By 2005, he had 400 acres in production, primarily for the organic dairy feed industry. Today, Oechsner Farms manages 1,200 acres, primarily for organic food-grade and craft beverage markets. The grandson of a German-born pastry chef, he is also one of Farmer Ground Flour’s three business partners. Last but not least, Rachel does like to stay in the background. She grew up in Trumansburg, NY, traveled a lot, and lived overseas for 15 years, and returned to the area, where she has lived for the past 17 years. She believes in the environmental benefits of organic farming, believes in producing and eating good food and the positive impacts this has on individuals and the community. She is a passionate endurance rider, and competes in 50-100 mile events with her horses. Like Brendan, and Thor, she laughs a lot, and pretty loudly, too!